Last week saw 215 games released on Steam, a number that has been steadily trending up since the launch of Steam Direct. Valve launched its new self-publishing program, Steam Direct, back in mid-June. Under this new program, which replaced Steam Greenlight, developers would have to pay a $100 fee to place a game on Steam. While some praised the low barrier as a positive thing, others felt that it would lead to an increase in the already crazy number of games showing up on the store (full disclosure: I thought it was too low as well). So far, the numbers seem to be showing that we can expect a lot more games on Steam in the coming weeks. 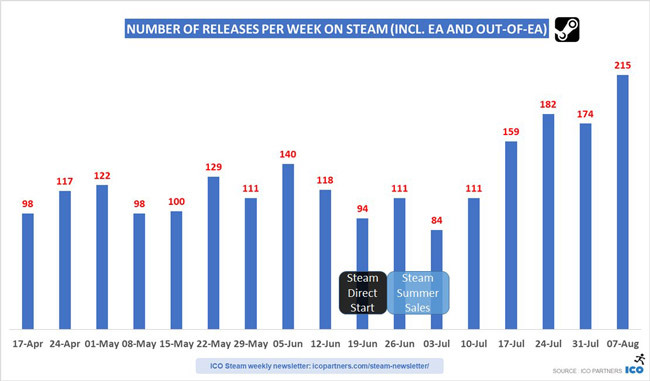 According to statistics gathered by Ico Partners' Thomas Bidaux (see graph above), the first week of July 2016 (when Greenlight was still in place), there were 28 games released on Steam. This year, that number was 84. Since that week, the number have been trending upward, with the number of launches peaking at 215 games last week alone. It's difficult to point the finger squarely at Steam Direct, as we don't have access to the inner workings of Steam, and Valve did say that it would be approving a number of titles that were still left in its Greenlight program. That said, it does seem suggestive of a pattern that may continue, and certainly bears watching. If this trend continues, discovery is likely to become an even bigger issue on Steam than it already is.